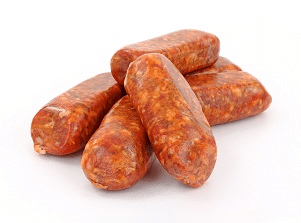 BSA offers you a rich variety of pre-mixes, with or without binder, to prepare delicious fresh sausages. Below, discover our wide range of flavours. With the printable document, you will have a quick access to all sausages flavours and product codes. The document also includes coloured symbols that allow you to identify at a glance which sausages are spicy and which sausages are gluten-free. We have also marked our best selling products in Quebec with a gold star! Basic seasoning, with a red colour, used to make breakfast sausage Very popular! Its French name means “Burns the mouth”… Very spicy! To be used with binder 7D249 or 7D248. A seasoning that accompanies the taste of the meat without masking it. A sausage with a taste of the grill. The taste will remind you of churrasco, a traditional Brazilian specialty. Delicious mix of lime and cilantro (dried coriander leaves). Excellent with chicken meat. A sausage with fine herbs taste, without MSG (monosodium glutamate). Recommended for game meat. A sausage with a true taste of maple! Basic seasoning, no taste, no colour. Used to develop customized recipes. Louisiana style seasoning. Very spicy!